I kind of think if I went entirely screen free for a whole week I might go a little crazy. I am so reliant on technology for everything on some days- random Google search answers to questions, YouTube videos of baking soda volcanoes to appease my son, recipes for dinner, emails from my son's preschool about important events, or quick text messages to a mass group of friends telling them we are finally escaping our house and please come join us at the park! I also feel like the internet is a gift to stay-at-home moms. There are so many great resources for parents (like awesome Kid-Friendly blogs) and ways to connect with others. I have met so many wonderful bloggers, educators, and friends through this blog. Although the internet has some wonderful uses, it can also be a huge waste of time! It is easy to scan blogs or browse Pinterest and not actually do anything! It is also easy to get caught up with checking in with friends via Facebook and Twitter and spend far too much time reading about what other people are doing. I go in waves where I'm online tons and then have days where I only do a few obligatory things and barely check Twitter or Pinterest once. Anyways, I'm working towards more moderation and a better balance of screen time in our home. There are weeks (like the first couple of my current pregnancy) when DVDs have been on a lot because I am too tired to function! So, as part of Screen Free week, I'm looking at screen time in our home (mine and the kids), and setting some goals to make it work for us. I am also issuing you a challenge to look at your screen time, work from where you are, and set your own goals for this next week. EJ and I are joining with Hands On: As We Grow and Creative with Kids to make Screen Free week into a bit more than a one week screen free blitz. We want to challenge you to look at how screen time works in your house and make a change if it isn't working or you are feeling like things are out of balance. 1. Be screen free with the kids all week long. Anytime they are awake, screens are off. My kids are much happier and less demanding when screens are off... but I am totally guilty of occasionally turning on a movie so that I can cook dinner or wash the dishes! Some of you are already great at this... I am not. :) This week I am going to try to be better. 2. Make sure to stay hands-free at the park (put my phone in the stroller and away from me). Sometimes I use my jog and park time to catch up on the phone with my sister. This week I am going to work even harder to be present and not talk on the phone or even sneak a peak at emails). 3. Use naptime to work on projects, not catch up on emails/messages. Whenever I sit down at my computer during naptime I can plan to be on for just a minute and then an hour later I realize I'm still online. I love the idea of using a timer... if I do have a business email or two, then I'm going to try and set a timer for myself. Other than that, no computer during naptime! 4. Only work on the computer for one hour in the evening after my kids are in bed. This is prime work time for me... but I am going to cut back and attempt to read a book I am behind on and possibly even get to bed early. 5. Plan a Screen Free (at home) date night on Tuesday and Wednesday night with my husband! We have date night every night and usually chat and watch one show on Hulu, but I'm going to try and be more creative this week. 6. Team up with two friends to celebrate Screen Free Week. As I mentioned above, I'm joining with Hands On: As We Grow and Creative with Kids to participate in Screen Free week. Each of us will be taking two days off this next week so that together we will complete a whole week screen free! I will be offline completely on Tuesday and Wednesday, though I may have a prescheduled post on the blog those days. If you try and contact me via email or leave a comment on those days, don't worry, I will get back to you when I return on Thursday! 7. Keep the DVD player off in the car. This one is seriously going to drive me insane... but it needs to happen. My daughter hates the car, so I tend to use the DVD player far too much when we are driving. Now she is totally used to it and says Elmo every time we get in the car. I did a practice run today and she wasn't terrible... I just had to do more singing. 8. Explore some new places in our community, create lots of projects and activities, and connect with friends we haven't seen in awhile! We already do this every day... but we are going to do even more this upcoming week! I'm hoping that I didn't bite off more than I can chew with this list. I recommend starting small and maybe even picking one goal (maybe don't follow my lead?). I can't wait to hear how you make this challenge work for you. Alright, so what are your Screen Free goals? for you? for your kids? 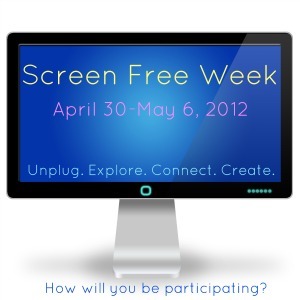 Are you going to participate in Screen Free week? How are you going to make it work for you? You have just reminded me of how I always had to sing to my daughter in the car when she was a toddler. She has never been a fan of car rides, but we only use the dvd player for trips longer than an hour. Now, it's gotten a little better at four, and I don't have to sing but still have to listen to kids music on cd's. These are great! We have a list of activities we'll be doing during Screen Free Week! :) And my husband is even jumping on board with limiting his screen time! :) Have a great 2 days off! I love reading your blog! Those are good goals. I am going to do your goal of only using the computer for an hour in the evening. I'm going to limit screen time for the kids too. I like to read but I've been bad about making time for it. Now I will have time for it! Thanks for the motivation!